To get a real taste of the free-wheeling Amsterdam zeitgeist, consider staying at one of the legendary Flying Pig Hostels. These irreverent and youth-driven establishments offer all the amenities of a good hostel: you will find a clean bed for the night (either in a dormitory or a more private room), a decent breakfast, WiFi access, and a free-flowing stream of information on the best places to see and be seen in the city. There are three Flying Pig Hostels: uptown, next to the Leidseplein square, where you will find a plethora of bars and clubs; downtown, next to the Amsterdam Central Station and the Red Light District; and the Flying Pig Noordwijk, which is outside of Amsterdam, conveniently located to allow resident to make a day trip in the direction of their choice to Rotterdam, Den Haag, Leiden, Haarlem, or Amsterdam. 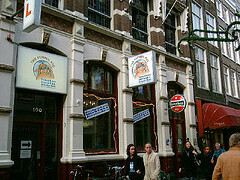 The Flying Pig Hostels are truly central to the youth experience in the Netherlands. Each of them offers liberal drinking and smoking policies, and parties are the name of the game here. Since marijuana use is legal in the Netherlands, it is not unusual to find a group of Flying Pig residents happily partaking of a bong or a smoke openly. In fact, that you will probably be invited to join them. Although this might not be the place to stay if you are looking for a quiet, reflective time in the Netherlands, it is certainly the most exuberant and joy-filled youth hostel that has ever graced the small nation’s shores. Booking a room at one of the Flying Pig Hostels is simple. Their website offers easy online booking, as well as information on what there is to do in the surrounding region. Last updated by Mary Van Keuren on 10 January, 2012 in Lodging. Thanks for the info on Flying Pig Hostel. Nice share!